Founded in 2007, Upwind Solutions provides services and software to improve operational costs for wind farm providers. The technology and software company’s solutions include maintenance, parts, engineering, repairs and technological support for wind turbines across the nation. Upwind Solutions chose LyntonWeb through a HubSpot connection. One of Upwind’s associates runs the San Diego HubSpot User Group (HUGS), while LyntonWeb runs the HUGS in Houston. After collaborating with Upwind Solutions on templates and content strategy, LyntonWeb set to work building a fresh website on the HubSpot platform. 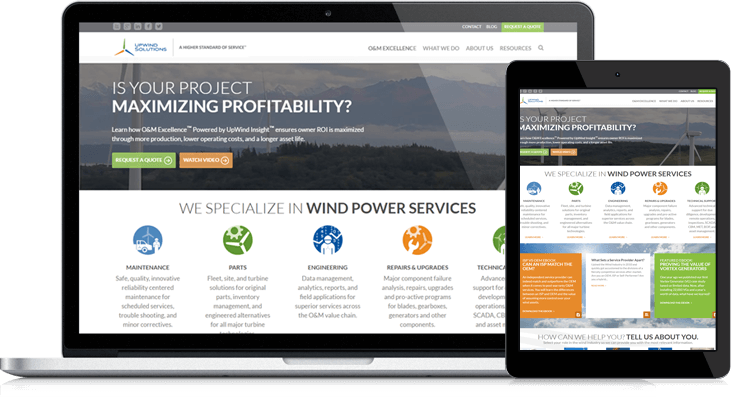 Not only does the new site provide a detailed overview of all the services Upwind provides, but it gives individual personas a clear path for obtaining more information..
LyntonWeb established routes for each user type to conversion points, with the homepage featuring options for five different specific buyer personas in the wind energy industry. The homepage and other areas of the site provide proof points, backing up the quality and extreme efficiency of Upwind Solutions, mainly through satisfied customer testimonials. Additional proof was provided at launch, with the release of case studies backed by third-party resources to support efficiency claims of the process and technology Upwind brings to the industry. Content continues to be released as part of the company’s marketing efforts. The greatest benefits of Upwind Solutions are enhancing the reliability of operations and reducing the cost of management. Both factors are now highlighted front and center on the homepage, along with easy access to more information that outlines how wind farm producers can get there.